There I said it. 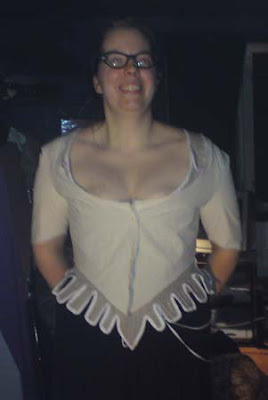 My bodice fit me fine without sleeves but when I put them in, they create havoc with the fit. Now I need your help to figure out what to do. Lets start with some pictures of the misery, shall we? Here you can see how the sleeves drag my shoulder straps of my shoulder. The overarm width feels OK, they are snug but not overly tight but I think I need to add at least 1,5 cm since muslin stretches and damask and stiff linen will not. I think that I need to make the sleeve head higher, when I move it feels like the top of my shoulder doesn't have enough room to move around and drags the bodice down over my shoulder. I don't know, maybe I should make the armhole a bit bigger in the front too? Or will that make my problem worse? Oh, I really want this to fit so I can start with the fun part. I've already stitched together the back panels so as soon as the lining is finished I can just cut and work. Now sleeves isn't my thing either, so I don't have any brilliant suggestions. But perhaps you could fiddle a bit in how you set them? Put the sleeve seam a little further back or front? 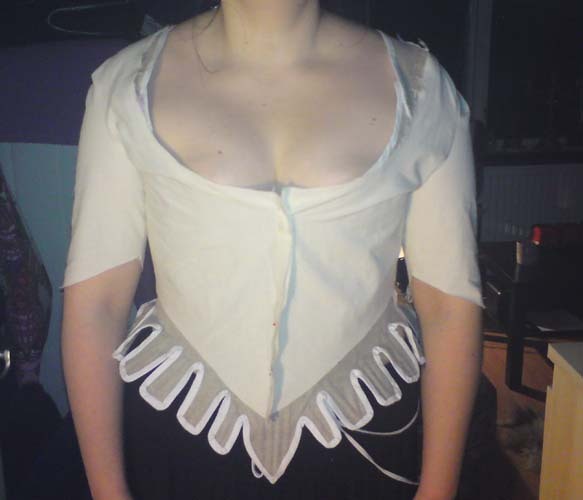 Now that I slept on it I also think the sleeve is the problem, not the armhole/bodice. This morning during breakfast tea I compared the circumference of the armhole on my bodice with the circumference of an armhole for a tight fitting modern jacket with tight sleeves and my bodice had a bigger armhole! So I have added a little more on the arm width and 2 cm on the height of the sleevehead and we'll see how that turns out. I can't really see, but it looks like your sleeve-head and armhole both need to be a bit bigger. I'm good at sleeves - but it is just blind luck, I don't know what I do!